One thing I find myself doing every once in a while is trying to find out the $AAPL share price for a given date. This usually requires a trip to Google Finance or Yahoo Finance and a need to download a data table to find what I need. Wouldn’t it be nice if this information was in my journal? Takes Yahoo data as at the time it runs (so theoretically you could run it multiple times a day). It does nothing on weekends, but it will run on holidays. 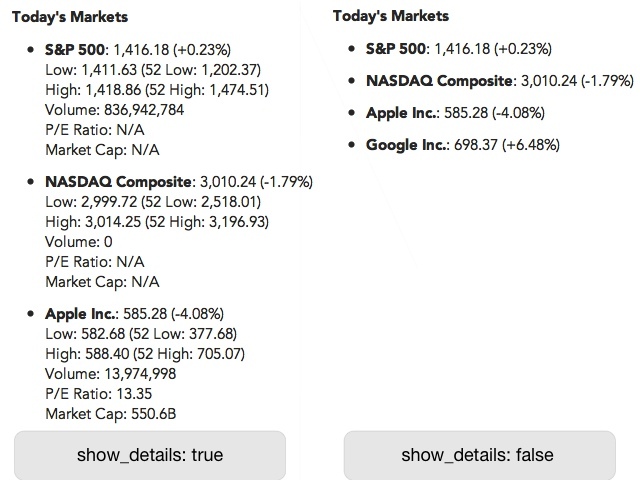 Allows you to choose a list of tickers to report on. You can choose a detailed log or a simple one. Given that it uses the Yahoo real-time API, it cannot be used to back fill data. Warning: This plugin is alpha code, so assume the usual no warranty legaleze, basically proceed at your own peril. Edit the tickers list in slogger_config for the ones you want. See also Google Analytics Logger for Slogger. Follow the author as @hiltmon on Twitter or @hiltmon on App.Net.